Cadillac Girl is a nice typey mare and a good producer. Sired by the show stallion Rimlo Black Valiant, who carries 3 lines to Flyhawk and 3 to Go Hawk, both major 20th century Morgan sires. Cadillac Girl's dam, MT Tawonga Miss Mary, is of Australian lineage, carrying lines to the very influential sires Upwey Ben Don and Ulendon. Cadillac Girl has lovely bloodlines and a promising future as a broodmare. Available for breeding to all Morgan and Arabian stallions. Other breeds considered upon request. Please check open foaling years below. 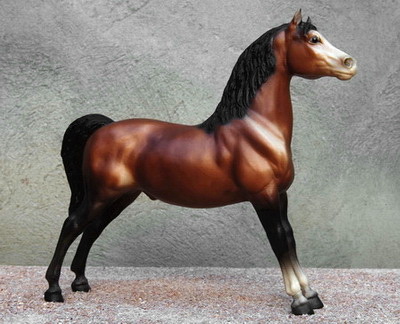 Bellasera is a beautiful mare bred by Caballos Del Mar, whose famous Morgan program is very popular among breeders. Bellasera's sire is the IMEHA Champion, CDM Royalty. He also achieved a ROM with AMMHA, and sired 20 purebred Morgan offspring. He is by the World Champion Stallion, Nobility, a descendant of the very influential sire Waseeka's Nocturne. CDM Royalty is out of CDM Radiant, a daughter of Black River Pegasus, whose bloodlines include Ulysses and Mansfield. CDM Radiant's dam was CDM Renee, a daughter of the great stallion Vigilmarch, sire of 81 registered purebred offspring. His progeny have proven to be very successful producers and performance horses. 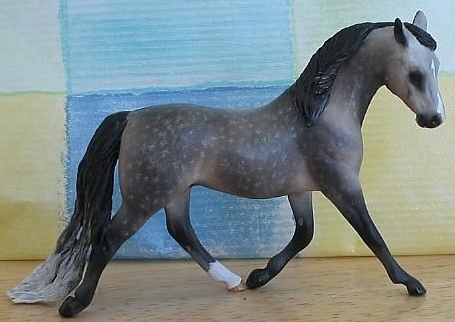 Bellasera's dam is CDM Marvelous, a gorgeous buckskin mare. She achieved many awards, among which are IMEHA Superior Champion, AMMHA Copper Medallion and IPABRA Top Ten Dam. She is by Blacksaddle Starbuck, a son of the great show stallion Blacksaddle Gold. His lines also include Mansfield and Marvelous Ideal. CDM Marvelous was out of CDM Merry, a IMEHA Premier Champion. She is out of Final Command, a grandson of Waseeka's Nocturne. Through Oaklea Miss Carousel, lines go to Pecos and Upwey Ben Don. Bellasera is a beautiful mare with great potential as a show mare and producer. She is the perfect dam if you're looking to breed a classy show Morgan. Available 2008, 2009, 2010 - 2011, 2013, to all Morgan and Arabian stallions. Other breeds considered upon request. 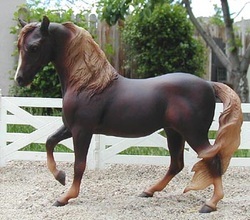 Royalton Emilia is a very rare coloured mare, carrying both the genes for sabino and rabicano. Her sire, Ancan Alliance Of Danger, is a grandson of the influential stallion Waseeka's Vivo, who in turn is a grandson of the AMHA Show Horse Hall Of Fame stallion Waseeka's Nocturne. In fact, Ancan Alliance Of Danger carries no less than 6 crosses to Waseeka's Nocturne. Further lines include Kingston, Ulendon and Mansfield. Royalton Emilia's dam was one of our own foundation Morgan mares, Royalton Eletta. She is by the very beautiful sabino stallion Dawnhill Storm Cloud, a multiple World Champion Carriage Driving horse. He is a grandson of UVM Highlight, a son of Orcland Vigildon (a bloodline known to throw odd colours). Royalton Eletta's dam was Royalton Edellen, a daughter of the influential sire Ethan Eldon. Royalton Edellen's great-grandsire on her dam's side was Moro, the leading sire for the Lippitt bloodlines. Royalton Emilia is a very promising broodmare. She will likely produce very beautiful, rare colours when crossed with any of our stallions. Available for breeding 2013 - onwards, to all Morgan stallions. Other breeds considered upon request. Would like fillies to have 'Royalton' in the name, but this is not obligatory. Royalton Eletta is part Lippitt Morgan bred. She has great lines that include Moro, Ulendon, Vigilant, Bennington and UVM Highlight. Eletta crosses very well with our entire string of stallions to produce nice solid foals. Available for breeding to Morgan and Arabian stallions. Other breeds considered upon request. Please check open foaling years below.